Someone mentioned this the other day, but the Washingtonian has an article on the fight over control of Cato. Whole thing is worth reading. Equity markets are flat after yesterday’s bloodbath, while bonds continue to rally. The 10 year is trading at 1.59%. MBS are up as well. Lest anyone think this is strictly a US phenomenon, yields in the “safe” European countries like Switzerland, Denmark, Germany are even lower. On the other hand, Greek debt now yields 30.6%, which is pretty much the same level it was before default. Today is Jobs Day with a slew of labor-related economic releases at 8:30. Challenger has already said that announced job cuts were up 67% YOY in May. This is a notoriously volatile index because one large employer (in this case HP) can dominate the month, so you have to focus on the trends and here 10 out of the last months showed increases. On the other hand, announced job cuts don’t always happen so take it with a grain of salt. That said, there aren’t a lot of forward-looking labor measures out there. Initial Jobless Claims came in at 383k, higher than the 370k estimate. The ADP Employment change report predicts 133k jobs were added in May. 1Q GDP was revised downward to 1.9%, in line with expectations. Consumption, exports, and residential fixed investment (finally!) drove Q1 GDP growth. Delays in foreclosures and recent incentives by the Obama administration are making short sales more attractive to lenders than foreclosures. Short sales were up 25% from a year ago as opposed to bank-owned sales which dropped 15%. More aggressive pricing on the part of lenders is driving the increase. Given the outsized rally in Treasuries yesterday, you would have expected a commensurate drop in mortgage rates. But that didn’t happen. Mortgage rates are moving lower only grudgingly as rates fall, indicating that we may be reaching a floor, or at least further drops will be very hard to come by. A sloppy tape to start the day as Euro fears take center stage. Spanish credit default swaps are at 522 basis points, an all-time high. Troubled Spanish lender Bankia continues to fall. Greek sovereign debt is over 30%. The beneficiary of the risk-off trade is the US 10-year, where yields are down 6 basis points. Meanwhile, oil cannot get out of its own way, with WTI down 15% this month. The 10-year yield is flirting with the Sep low of 1.673%. MBS are unchd, and we are witnessing a similar phenomenon as last fall, where the 10 year rallied and MBS underperformed. The spread between the Freddie Mac generic 30 year fixed mortgage and the 10-year bond yield is 2.04%. Here is a chart of the generic 30 year fixed rate mortgage, the 10-year bond, and the spread between the two. 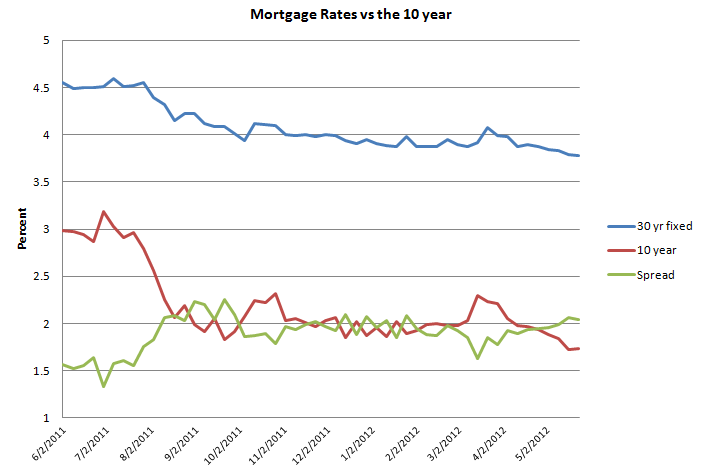 While mortgage rates are falling as the yield on the 10 year falls, they are falling much more slowly. So, if you are facing a lock decision, you have are faced with a bit of a conundrum: If the 10 year yield continues to fall, mortgage rates might not participate. In other words, we may be reaching a floor in mortgage rates. Which means you might as well lock. On the other hand, if the 10 year yield starts backing up, mortgage rates should rise much slower since they really didn’t fall that much to begin with. Which means you have some room to wait and see what happens, and you might want to float. So, lock or float? IMO, when markets crack, they crack quickly. And the 10 year is at very lofty levels. It could go from 1.7% to 2.4% in a hurry. The risk is more skewed towards mortgage rates increasing quickly than falling quickly. I would lean short in mortgage rates, or in other words, lock. Part of the reason why the recovery has been so halting has been that the job market for those in their prime earnings years has been horrendous. Instead of making the top salaries of their lives (which they need to pay for college for their kids and also retirement savings), many people in their prime earnings years are either unemployed or underemployed. This is a huge drag on the economy. The S&P Case-Schiller index posted a slight sequential gain in March, but was still down 3% YOY, and made a new post-crisis low. Nationwide, house prices on average are back at their mid-2002 levels. That said, the pace of the decline has definitely slowed. The Western Conference Championship is of interest to me and Okiegirl. I have some additional observations about the Spurs. 1] They are very deep. They have twelve reliable players, even if they can only play 9 in a given game. 2] They are flashy when Ginobili and Parker are on the floor at the same time because of the passing game. If you like no-look find the open man, or pick and roll, or give and go, or fast pass-touch pass basketball, this is where to see it. 3] Ginobili and Duncan will not be on the floor more than 32 of 48 minutes. Depth allows this. The two can play as if “young” for 30 minutes, but not for 37. 4] They do not defend as tenaciously as the Robinson-Duncan era team, or in the same way. The team defense is good and smart, but neither great nor spectacular. 5] Parker absolutely abused Westbrook last time these teams played, but I would not expect that to repeat. 6] This may be the best shooting team in history, and the fast passing provides comfortable looks. 7] This team is relaxed even when down 24 points, as they were to the Clips in game 3 of that series. They won by double digits. No nerves. 8] No one on this team can stop Durant, or really slow him down, one-on-one. Okie, what about the Thunder? 1] Thunder are deep too! After all, we have Harden, the 2012 NBA 6th Man of the Year. “Fear the Beard” t-shirts are selling well locally. That should be a great match-up with Ginobli. But Collison and Mohammed also get the job done. I think Collison in particular is underrated. 2] Thunder aren’t particularly flashy, and I think the pick and roll might be a problem for them defensively. 3] Hahahahahaha. There is not a team in the NBA that can hang with the Thunder’s “young” legs. Rest all ya want; it just means the starters are not on the floor and, subtle as the difference may be, there’s a reason the starters are starters. Thunder starters can stay on the floor longer. 4] Kevin Durant will be a problem for the Spurs. I look for him to have some big games. 5] This could be a key to the series. But Westbrook has been on a roll. We’ll see. 6] As a Thunder fan, this concerns me. Offensively, Spurs may pick them apart. But don’t forget the defensive value of Durant’s speed and 7’5” (or whatever) wingspan. 7] Ditto for the Thunder. This actually has been a surprise to me, given their youth. 8] Bingo. See number 4. I have to note how much I love the fact that it is two small market teams in the west finals. The teams seem to have similar philosophies and values that I find wholesome. I know someone who came here with the team from Seattle and still works in the Thunder organization, and reportedly the players love being in OKC and the way they are treated both by the organization and by the community. I have seen nothing locally to indicate otherwise. Win or lose, you never hear Thunder players blaming teammates a la Kobe. As far as I know, it’s the same for the Spurs. Mark, any thoughts on that? Now for a little local color. Since it was national news, I suspect all have heard about the shootings that marred the final win over the Lakers (although reportedly having no connection at all to the game). There is a small plaza in front of the arena where the Thunder play. There are concessions, bleachers, a jumbotron, etc., and hundreds all this season and in prior years have gathered for pregame festivities (been there myself when I had tickets). For the first time, for this year’s playoffs they have showed the game in entirety on the jumbotron instead of shutting down at tipoff. This drew thousands instead of hundreds. If you watched the Thunder-Laker series you probably saw some cool shots of it on TV. If not, not as cool but see this or [aarrgghh, cannot get link to work]. Hmmm, 5,000-10,000 people packed into a very small area with no controlled access and where alcohol is sold, what could possibly go wrong? Due to the recent shootings, the City and the team immediately discontinued Thunder Alley for “public safety reasons” due to the actions of two punks. Locals are furious. Hopefully they will find an alternative venue. Edit by Okie: My prediction: Spurs in 7 cause they are playing absurdly well right now. Reserve the right to change the prediction if Thunder manage to steal one of the first two in SA. Posted on May 26, 2012 by Let the mutherfuker burn!